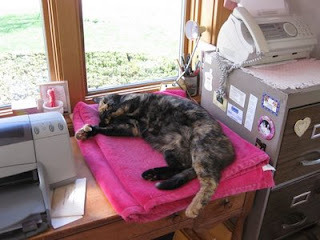 We received this cute photo and note from Sundae, a kitty adopted from the shelter a few years ago. Her family refers to her as "Super Cat Sundae" thanks to her work finding and killing mice they never even knew they had in their house when she first moved in. Life is good here in Westwood!! Except....remember those mice I found when I first moved here? They're all gone!